Ramallah, West Bank - Palestinian officials said Monday that the U.S. has suspended West Bank development projects worth tens of millions of dollars after Congress froze funding to dissuade the Palestinians from seeking U.N. recognition of an independent state. It’s the first concrete sign of repercussions for the Palestinians’ decision to defy Washington on the issue. 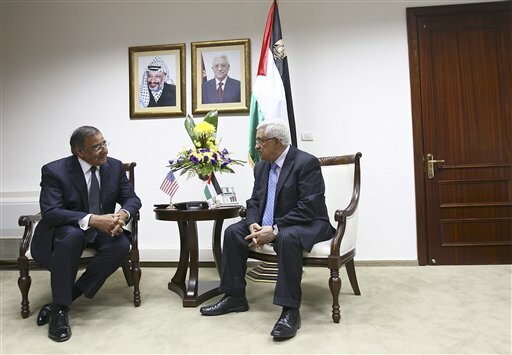 Hassan Abu Libdeh, the Palestinian economics minister, said he was informed Monday by officials of USAID, the U.S. government’s foreign aid agency, that two projects — worth $55 million and $26 million — were being put on hold for lack of funding. One supported the development of the Palestinian private sector and the other aimed to improve the investment environment, Abu Libdeh said, adding that 50 people involved were laid off last week and 200 others would follow by November. Other ministries also reported USAID projects were in jeopardy, including an $85 million five-year plan to improve Palestinian health services. USAID officials confirmed some programs were affected by the Congressional hold, but would not give details. “Ongoing programs will continue until funds are exhausted,” said one official, who spoke on condition of anonymity because he was not authorized to discuss the matter with the media. Palestinian officials denounced the move as counterproductive to Mideast peace efforts and said this would not deter them from seeking full U.N. membership for a state of Palestine in the West Bank, Gaza and east Jerusalem — lands Israel captured in 1967. Two Republican-led committees in the House — Foreign Affairs and the Appropriations subcommittee on the State Department and Foreign Operations — put a hold on $200 million in economic assistance in late August, as the Palestinians were gearing up for their U.N. move. Palestinian President Mahmoud Abbas last month proceeded anyway, presenting his case for recognition in a speech to the U.N. and formally submitting a request to the Security Council. The Obama Administration finds itself caught in the middle — opposing both the Palestinians’ U.N. gambit and the Republican moves to punish them for it. Keeping the aid flowing “is not only in the interest of the Palestinians, it’s in the U.S. interest and it’s also in the Israeli interest, and we would like to see it go forward,” State Department Spokeswoman Victoria Nuland said Monday. The U.S. argues that a Palestinian state can only arise through negotiations with Israel and says it will veto the Palestinian membership application in the Security Council if the measure gains enough support. The U.S. — along with other world mediators — has called for a quick resumption of long-stalled Israeli-Palestinian negotiations, but the Palestinians say Israel must first halt all settlement building on occupied land. Donor countries have given billions of dollars to the Palestinians over the years, in an attempt to prop up the Abbas government and an economy battered by conflict with Israel and continued Israeli restrictions on trade and movement. The Palestinians have received about $500 million a year from the U.S. alone in recent years, including tens of millions of dollars for training the Palestinian security services. The partial suspension of aid by Congress mainly affects development and infrastructure programs being supervised by USAID but not the support for the security services. Israeli government officials declined comment Monday on the partial suspension of U.S. aid. However, Israeli Prime Minister Benjamin Netanyahu, while staunchly opposed to Abbas’ decision to seek U.N. recognition, has not rushed to retaliate. Despite the increasingly heated rhetoric, the two sides continue to cooperate on a practical level. Palestinian security forces work with their Israeli counterparts in keeping Islamic militants in the West Bank in check, while Israel every month transfers to the Palestinians tens of millions of dollars it collects on their behalf in taxes and other payments. I really do not like this maneuver. The PA can appeal to the UN that the US is taking food away from Palestinian children. Everyone knows that the PA leaders funnel most of the money to themselves but nobody wants to acknowledge this publicly. I also dont like the US sticking its neck out for Israel - it gives fuel to the anti-Semites who claim that Jews run the country. this has got to be one of the most biased articles the ap has written yet. "donor countries have given billions of dollars over the years...an economy battered by conflct with israel and continued israeli restriction on trade and movement". besides the fact that it is the palis that have chosen conflict or to be more accurate,extreme violence there, leaders have pocketed most of the relief money. like the anti semites need fuel. what kind of twisted,galus thinking is this? It's high time that United States stop giving them aid. In fact, it would have been far more moral to have made the abandonment of terror and violence as a condition for any aid. The only way such a condition could be imposed would be to only offer the aid if there was an extended period of NO terror. United States could have saved billions of dollars. If they have been getting billions of dollars from countries over the years, they should be looking a whole lot better than they are now. In any job/charity/organization one needs to show where the money goes and what it has accomplished. I say send them nothing. They are not using it for any good. The U.S., no any other country, is obligated to give them money. Let Hamas make cold-calling phone calls to raise money here and there. If it is really needed to feed their young, fine. Let's import all their kids under 10 and take care of them. It will cost a lot less. That's ridiculous, the US warned Abbas that this would be the consequence. They had no choice but to follow through. On the other hand, with all the rich Arab Countries that we all pay through the nose to, why is it that America has to fund them and not their own Muslim brothers? I would not worry, the Saudis are giving them millions!! Has anyone here followed the news that the White House is fighting Congress and trying to release the money. Both parties in the House and Senate are in favor of the withholding, and Obama and his henchmen are counting on the pressure through the few Representatives and Senators who oppose the withholding. I hope Obama goes down in history as having been among the worst enemies of Israel, and the greatest supporter on Muslim terror. Actually the Saudis and Gulf States have commited to billions but have not honored those commitments. you mean like when mordechai refused to bow down to haman? That was Mordechai refusing to bow to a live idol..nothing to do with Nationalism. Mordechai was a good "court Jew". The type of person you despise.